Have a question for Netibo Pension Haus? 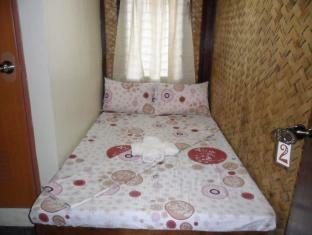 Ideal for fun and relaxation, Netibo Pension Haus is located in the El Nido area of Palawan. The hotel lies from the city center and provides accessibility to important town facilities. With its convenient location, the hotel offers easy access to the city's must-see destinations. At Netibo Pension Haus, every effort is made to make guests feel comfortable. To do so, the hotel provides the best in services and amenities. For the comfort and convenience of guests, the hotel offers 24-hour room service, Wi-Fi in public areas, tours, laundry service, shuttle service. Hotel accommodations have been carefully appointed to the highest degree of comfort and convenience. In some of the rooms, guests can find linens, towels, internet access – wireless, non smoking rooms, air conditioning. Besides, the hotel's host of recreational offerings ensures you have plenty to do during your stay. Discover an engaging blend of professional service and a wide array of features at Netibo Pension Haus. The house is cute. Very. The water was white. Very. And it had a smell. It smelled of sewage. When we asked them about it, the stuff told us to just leave it on for 10 minutes. We did.. And then we asked for the refund. Pros: good location, good staff, descent room, helped to book boat tickets and tours at good rate Cons: bathroom was really stinky, toilet seat was broken, just not in gooe condition. A little expensive for budget travellers. When we arrived at the hotel with ouyr agoda booking, we were informzd that they were fulled. They offered us to go to another hotel with the same price that we already paid. Expect new hotel was farther of city center and only has one night available whereas we hab booked for 2. We disagree and tjey reimbursed us. Except we had to look after an hotel for ourselves. We arrived around 3pm off a bus from Puerto Princesa and checked straight in. Our room was on the second floor and had two queen size beds. The bathroom was quite small with a cold shower and no toilet roll. The beds were comfy but my partner found dirt and hair on the sheets. The location is very close to the main town and beach. However the walls are very thin as they are made from woven wood, so you can hear the people in the room next door and all the road/street noise. So take ear plugs with you if you are a light sleeper. Wifi very poor. El Nido is a pretty expensive location and we didn't think Netibo was worth the money that we paid. Good for backpackers but I'm sure you could find nicer places slightly further out of town for the same money. My 5 friends and I (all exchange students around 20 yrs old) stayed in Netibo Pension Haus for 4 nights and I have to say that we were pleasantly surprised. We had 2 rooms with 2 double sized beds in it. There was an air conditioner and fan in each of the rooms. The bathroom was quite small, you literally shower next to the toilet, however, as the saying goes, you get what you pay for. The staff was friendly and helpful. Our water pressure went out for 1.5 days but we did not experience any major electricity problems. I would recommend this place for those who aren't afraid of "roughing it" and that want a local feel in a great location. Nice little place.. We had a room meant for 4 but it was for two really.. Anyway, clean and well located. Good wifi! The sink is not connected to pipes and there is a tap next to it with bucket underneath, the shower head is over toilet and no hot water. Dirty everywhere. Aircon and fan available so this was a plus. Very noisy with cats jumping on the metal roofs therefore impossible to get a good night sleep. There is no reception, just storage for some building stuff and motorbike at the ground floor. This looks like some kind of bad hostel, certainly not a hotel. This place is made of bamboo thatch. The walls are thin and it's quite noisy around the town. That being said, it is a decent place, although there are better places in town. They do have a generator that works sometimes, although they never turned it on at 6 AM, when the power is cut off to town. Not the best place to stay as the room are small, they have a generator running, which is smokey, plus its on the corner of 2 busy roads. Such small rooms! And the walls are paper thin I could hear everything from the people next door, cars on the road, roosters, chickens, dogs, etc. no hot water, but they did fill up my bucks with boiling hot water so I could shower with that. They did turn on the generator a lot during he day which was nice. If I wouldn't have paid for three nights on agoda I would have moved somewhere else. Also, cheaper rates at hotel directly. It's good if you are a heavy sleeper. room was small but cosy...was told dat electric oni from 2pm-6am but to my surprise dey hv their own generator dat allow me to enjoy 24hrs aircond(antique but strong power). owner was xtremely helpful..d oni issue is tap water has got a weird smell but it din bother me much as i tink is d same throughout elnido. 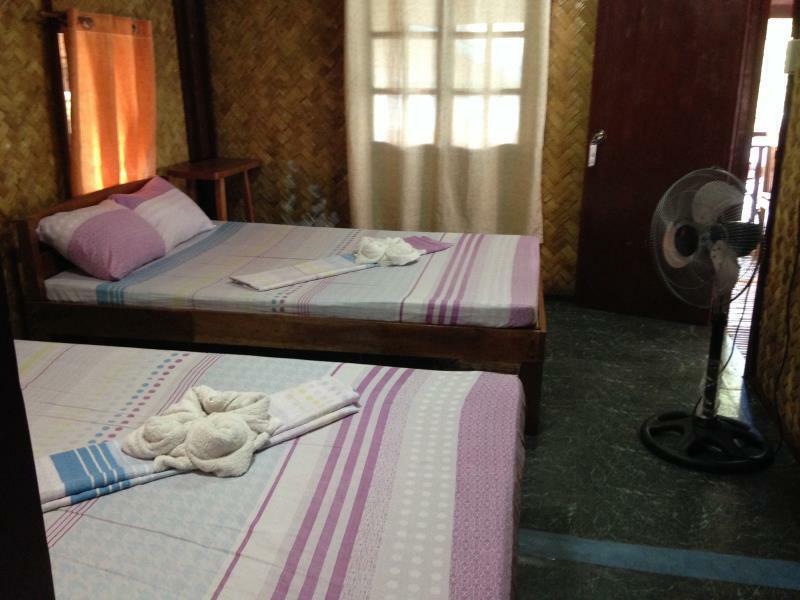 Place is generally OK, very humid and stuffy air inside (bur many rooms are like that in Palawan). I would recommended for one night only as a temporary option. On the whole good for the price. We stayed 3 nights over New Year. The staff inparticular Vic were very attentive and friendly. The rooms are very very small, which was ok for a few days but i think anymore than this would have been trying. It was perfect for Backpackers and couples or solo travellers on a budget. Great little outdoor seating area also. Location was good, central to everything, but not on the main street or the beachfront which tended to be noisy in the evenings. Very clean hotel. Les murs sont fins, on entend les bruits de la route mais surtout les voisins, salle de bain sale avec des amis cafards! Wir haben zwei Nächte dort verbracht, da nichts mehr anderes frei war. Auf den Fotos sahen wir, dass das Doppelzimmer sehr sehr klein war und haben deshalb ein Viererzimmer gebucht. Die Grösse war ok, zu viert wäre es sehr eng. Man darf nur ohne Schuhe in die oberen Etagen. Das Haus macht mit seinen Bambuswänden einen sehr wackeligen Eindruck. Immer wenn oben jemand durchlief wackelte die Decke. Der Ring der Toilette war gebrochen. Es hatte nur kaltes Wasser. Die Dusche war über dem Waschbecken und der Toilette. Nach der Dusche war alles nass. Wir werden nie wieder in diese Pension gehen. Das einzige positive war das Personal und der Standort. Das Personal war sehr freundlich. Durch die dünnen Bambuswände hörte man alles und damit meine ich wirklich alles!